Volvo to most people will mean a premium product, built to the highest standard possible with more safety than a padded cell whilst being built to last forever and cope on rugged terrain when required, especially the cross-country models as well as the XC range. The latest offering from Volvo is the XC90, the range topper in regards to its size, capability and available spec. The spec of this test model would require a full review on its own and I will try and touch on as much of it as possible but there are more toys available than Hamley’s in London. At a glance the new XC90 has a serious and purposeful presence on the road as it is big, safe and meaningful looking when off road. This test model is finished in a stunning, metallic Osmium Grey paint colour (£700 option) which adds a degree of richness to its looks. The 21” alloy wheels are probably one of my most favourite wheels of any car this year and come as a £1450 option. Looks are further enhanced with rear privacy glass at a sensible £400 option price while LED lighting technology is in abundance. Volvo have always been known for tall and thin tail lamps on estate and suv models and this is kept with the latest XC90 with the lighting climbing tall up each side of the tailgate towards the rear roof spoiler. Dual exit exhausts at each side of the rear bumper valance finish off the looks. 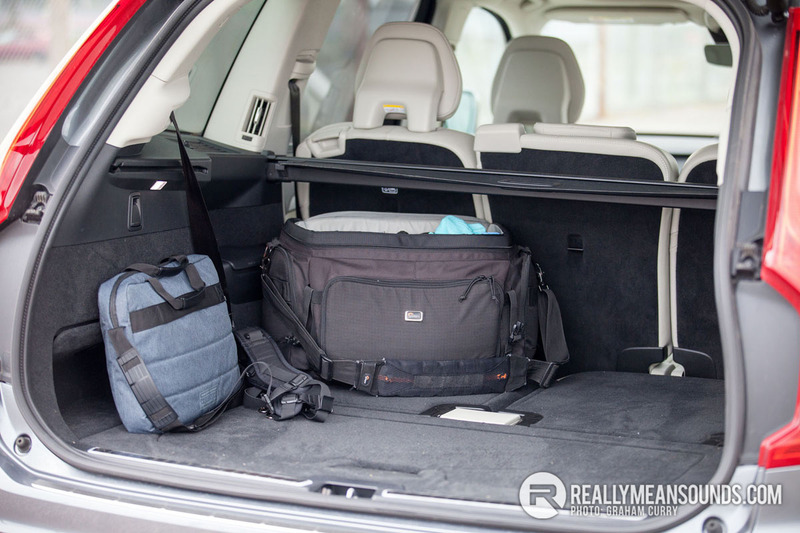 Opening the boot reveals a MEGA amount of load space, more space than anyone could need you would imagine, especially with both rows of seats folded flat. However I did need the space during my week with the XC90 as this picture within the editorial from my phone shows, it more than easily handled a small two seater sofa. Impressive, usable space due to the boxy nature of the rear end and even with all seven seats in use the boot space that is available is still great. 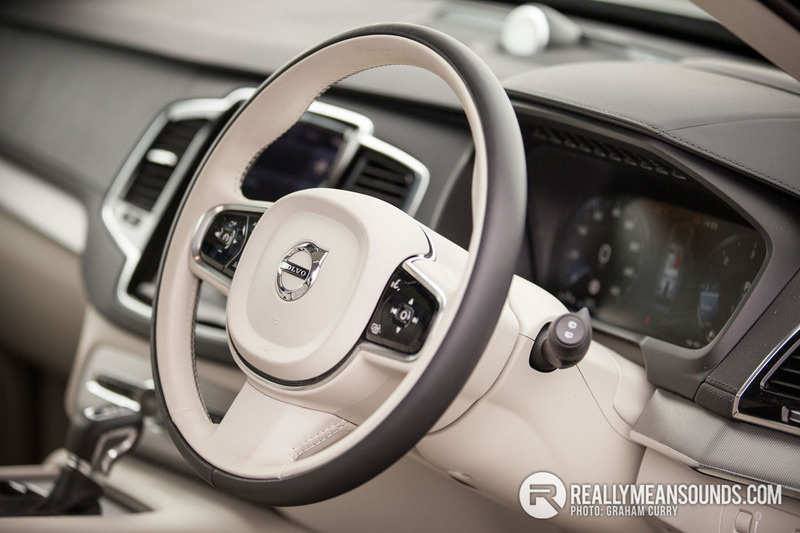 Inside the cabin of the XC90 is plush to say the least, a very handmade feel to it due to the quality. There was leather absolutely everywhere and although the cream upholstery wouldn’t be my choice, it is very much a choice than many Volvo owners will make however with just a handful of thousand miles on the clock the seats looked a few years old due to discolouration from dirt and clothing I would imagine. The two front seats were heated, cooled and electrically controlled thanks to the “Winter with Head-Up Display Package” (£1175 option) which also adds a very cosy heated steering wheel, practical heated windscreen washer nozzles and a head up display on the windscreen. A “Seven Seat Comfort Package” (“900 option) added 4-zone climate control with cooled glove box, 3rd row air con and power folding headrests on the 2nd row seating. Plenty of light flooded into the cabin thanks to the “Xenium Package” (£2000 option) which adds a power glass tilt and slide pano sunroof with sun curtain. On top of this massively functional roof the pack also adds safety features such as 360 degree parking camera for that bird’s eye view when manoeuvring, front and rear sensors and automatic parking for parallel and 90degree parking. This parking system was easy to use and dependable. I can safely say that Volvo has possibly put together one of the finest quality and built interiors on the market today, to put it bluntly there was no cheap materials anywhere and I could more than easily live inside of the XC90. The pinnacle of this XC90 for me however is the infotainment, and indeed the giant touch screen in portrait orientation built into the dash was only going to be outsized by the £3000 premium sound upgrade from Bowers and Wilkins. I once was into quality car audio and spent many an all-night stint in the garage upgrading audio in most cars I have owned and helping pals do similar so over the years I have been able to listen to some of the best aftermarket systems money could build. This system available from Volvo is simply perfect in every way, music numbs the mind and with the quality of the sound available from this upgrade you will struggle to appreciate the sound quality in many a discotec. Back to the touch screen again though, it is 9” in size and is one of very few cars that comes with the “tablet like” touch screen in portrait. 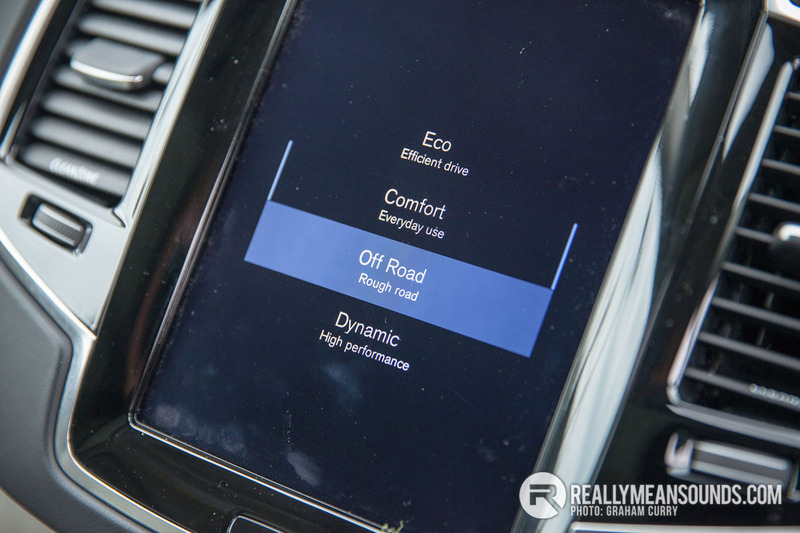 This screen isn’t just used for audio however; pretty much all of the cars controls can be accessed via it. Onto the hardware now and this XC90 is equipped with a 2.0 4 cylinder turbo diesel engine which was a shock to me as Volvo are renowned for their grunt filled 5 cylinder engines and being such a large vehicle I would have assumed it was equipped with such. I didn’t wait long to test the D5 engine however and with 225bhp and just shy of 350lb/ft it certainly packs more than enough grunt to propel you to 60mph in just 7.4 seconds with annual tax at a very sensible £180 for this model. 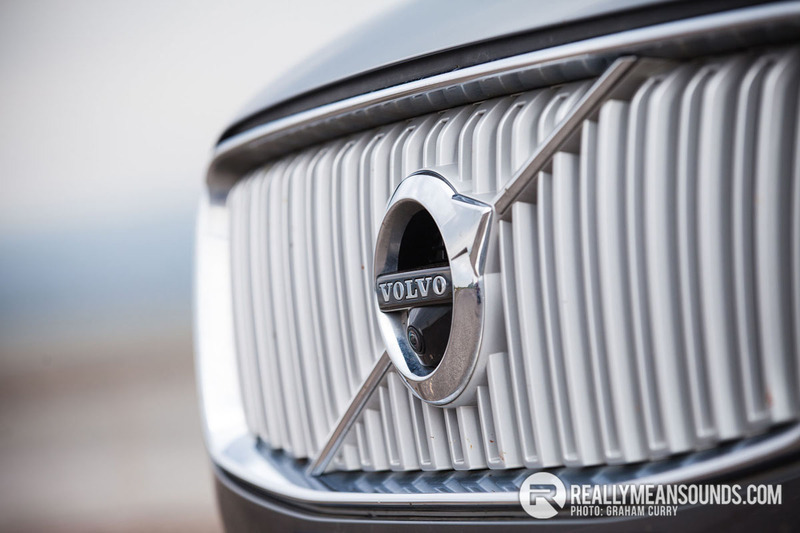 The engine is refined and much quieter than most engines of its type with a real world return of mid 40’s MPG over the week of mixed driving that I tested this outstanding Volvo. Towing capability has increased greatly with the latest model as it can now legally tow 2700kg braked opening it to many agricultural markets that have only ever really used a Land Rover before. Power is fed to the all wheel drive system via a smooth, precise 8 speed automatic gearbox which took all effort out of driving. Handling wise the model we tested was fitted with four corner air suspension costing £2150 allowing four suspension modes selectable via the touch screen. These include Eco, Comfort, Off Road and Dynamic meaning the XC90 with this adjustable option fitted can cope with all lifestyles and indeed cope with going off the beaten track easier than some rivals and indeed I do honestly think that this XC90 would cope within my favourite proving ground at Ireland Offroad Experience, if ever a dealer wants to let me try this please get in touch. On the road there is a little body roll as expected from such a vehicle however the Dynamic suspension mode soon assists, as does the hundreds of safety features built into the XC90 such as lane departure warning, auto pilot/cruise (one of the best systems I have ever experienced), queue assist and lane keeping aids. 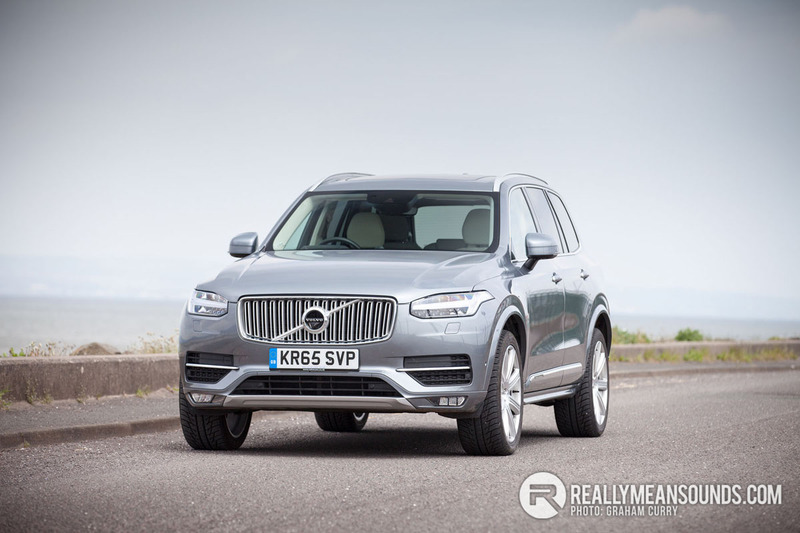 Overall I really do think that Volvo have created something to open people’s minds and get them out of the likes of the BMW X5, Audi Q7 and also now with the greater towing even get Land Rover Discovery 4 customers thinking about a little more quality with as much capability. Prices start at £46,250 for a D5 AWD Momentum model with the model tested, a fully loaded all options ticked D5 AWD Inscription coming in at £69,350. The price of a small house yes, but with more tech and comfort than many homes and you can’t take your house off road. I think the new XC is absolutely superb, even if you aren't able to look past the maximum engine size being 2.0 (And in that case, they have that pretty nippy hybrid) its got to be the best premium SUV for families atm. I absolutely love these. By far my favourite Volvo, until the S90 came out. One of my lottery cars. Loving the new Volvos. Look at them! And specced to the balls, the V and S are both a shade under £50k. | Look at them! And specced to the balls, the V and S are both a shade under £50k. Are they doing a polestar one of those? Love the V60 Polestars, Not cheap enough yet for me though! They really look well. Saw a lovely black xc90 in dublin yesterday. The s90 and v90 are class as well. | Are they doing a polestar one of those? Love the V60 Polestars, Not cheap enough yet for me though! Havent seen one, I'd have the D5 240.